With 10 different concerts throughout the week and special pregame and halftime performances on Sunday, the NFL’s calling Super Bowl LIII its most musical Super Bowl ever. 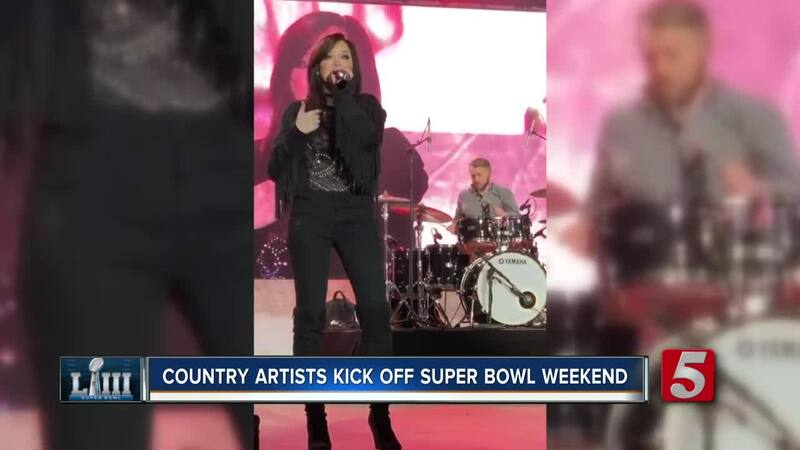 ATLANTA, Ga. (WTVF) — With 10 different concerts throughout the week and special pregame and halftime performances on Sunday, the NFL’s calling Super Bowl LIII its most musical Super Bowl ever. “And I’m glad to be a part of it,” Craig Campbell said Thursday night ahead of his performance on the NFL Live stage in Centennial Park. Campbell is one of two country artists that made downtown Atlanta sound a lot like Music City during the show. Tyler Reese Tritt, the daughter of country star Travis Tritt, helped start the night with a rocking performance back in here home state. “It was amazing, so much fun,” Tritt said. Tritt was followed by Campbell, who entertained the crowd as the night’s featured performer. Two Nashville based artists taking the stage around sport’s biggest stage. “It’s crazy. It’s really crazy,” Tritt said. And kicked off Super Bowl weekend in style.